Your nose is so far away from your uterus, how could it be involved? Many women experience symptoms of nasal congestion, sneezing and nasal bleeding during pregnancy. Many women will develop nosebleeds during pregnancy. For the most part nosebleeds are common and quite harmless. It can be frightening to some. Nosebleeds during pregnancy are more common as the blood vessels in the body expand and the volume of blood pumping through the body also expand during pregnancy. Being pregnant can increase the pressure in the blood vessels in your nose, contributing to nosebleeds. 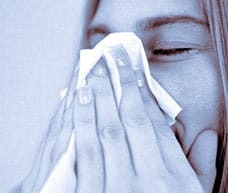 Nosebleeds are also common when a woman has a cold or when it is particularly dry out, as these conditions can contribute to membrane irritation. 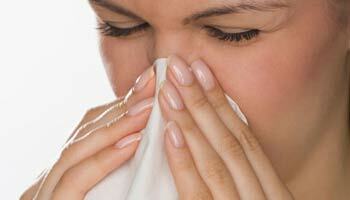 Blowing the nose hard can also contribute to irritation and may lead to more frequent nosebleeds. Pregnant women experience stuffy noses more often than their non pregnant counterparts, hence are more likely to blow more frequently. If you develop nosebleeds during pregnancy, there are several simple steps you can take to stop them. The moment you notice a nosebleed starting, make sure you sit up, and then apply pressure to your nostril with ice pack for 5-10 minutes. It will take a while for you to produce enough pressure to stop the nose bleeding. You can pinch your nostrils together by applying pressure to the outer nostrils. While you are treating your nosebleed, you want to be sure to avoid lying down or tilting your head back. This will allow blood from your nose to drip into your throat and stomach. That can produce nausea and vomiting, something you definitely won’t want on top of a nose bleed. and	Apply Saline gel or Vaseline to keep the nasal passage moist. and	Try using a humidifier in your room at night to keep the air moist in your room. Dry air can dry out mucous membranes and contribute to nosebleeds. and	Avoid blowing too hard particularly when you have a cold. Use soft tissue products like those with aloe to help soothe your nose. The surgeon will examine your Nose; Check your blood pressure, Blood Count, Bleeding time etc. If any cause for nose bleed is found, this has to be treated. Cautery with Silver nitrate under local anesthetic, or using a Diode laser will stop small bleeders. 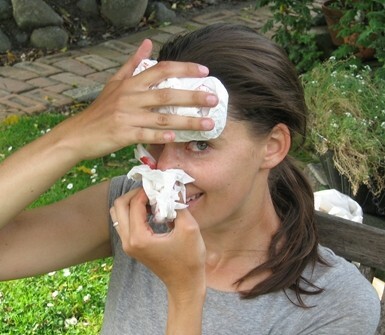 If bleeding is profuse, may need to pack the nose with Merocel soaked in Feracrylum (SicastatÂ® and Metrogyl. Also may need admission to hospital to replace blood if lost too much. 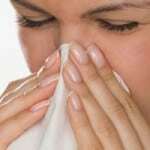 Symptoms include blocked nose, sneezing, runny nose and nasal itch. Nasal congestion is caused by edema and increased blood volume in the nasal mucosa, hyperactive seromucinous glands and increased glandular secretion. Women who already have nasal obstruction prior to becoming pregnant may suffer considerable exacerbation of their blocked nose. Conversely the rhinitis of pregnancy itself leaves women more susceptible to obstruction and infection from common â€˜cold\’ viruses, and resultant bacterial sinusitis. Sinusitis has been reported to be six times more common in pregnant than non-pregnant women. Other common symptoms are ear fullness and popping sounds secondary to Eustachian tube dysfunction. Nasal obstruction during pregnancy is related to endocrine factors and similar etiology is seen in nasal blockage associated with the menstrual cycle. Circulating blood volume increases to 40% above non-pregnancy levels by the third trimester. This may lead to increased nasal vascular pooling and increased nasal resistance. The generalized increase in interstitial fluid volume, also most marked in the third trimester of pregnancy, directly affects the nasal mucosa, contributing to congestion. Anterior rhinoscopy allows assessment of the anterior nasal septum and the turbinates and excludes any anterior nasal polyps. Prominent turbinates are often confused for nasal polyps. Rigid nasalendoscopy allows complete examination of the nasal cavity as well as assessment of the postnasal space. Unnecessary radiological imaging is to be avoided, especially in the first trimester of pregnancy unless it is urgent or acute. Medication should be prescribed during pregnancy only when the benefit outweighs the risk. Intranasal sodium cromoglycate and topical steroids are considered first line treatments. Intranasal fluticasone has not been shown to affect maternal cortisol or affect fetal growth when used in the first trimester. First generation antihistamines are favored over their second generation counterparts as there is more conclusive long term evidence for their safety. Oral decongestants and intranasal decongestants should be used sparingly. Topical saline preparations-saline spray, drops or gel can offer symptomatic relief and are completely safe. Topical decongestants: Xylometazoline- They cause direct vasoconstriction and shrinkage of the nasal mucosa. However the hormonal vasodilatation of nasal mucosa is relatively resistant to topical vasoconstrictors and over use is common. This leads to a resultant rebound nasal congestion (rhinitis medicamentosa). They are also rapidly absorbed systemically and there is concern (although not established) that local vasoconstriction may cause placental insufficiency and/or exacerbate hypertension of pregnancy. They should be used sparingly. Corticosteroids: NOT advised. There are variable reports of increased risk of oral clefts when given in the first trimester. Antihistamines: are used to treat allergic rhinitis. There has been argument for and against the safety of these drugs in pregnancy. Even though these drugs have been used safely in pregnancy, there remains concern (that have not been substantiated), regarding teratogenicity. Chlorpheniramine is preferred and if not tolerated, cetirzine and loratadine could be considered. As always the relative risk versus benefits must be considered. Oral decongestants: should be avoided in the first trimester. Antibiotics: These should be used for specific infections associated with nasal obstruction such as acute bacterial sinusitis. Penicillin (amoxicillin), cephalosporin and marcolides (erythromycin) are commonly used and are safe. In resistant cases surgery can be considered as last resort-Inferior Turbinate Reduction: This can be preformed using electro-Cautery, cryosurgery, laser or radiofrequency (Coblation), Nasal polypectomy â€“ all under local anesthesia. Any one who is prone to nasal obstruction, of Rhinitis of any cause, get it treated before pregnancy. Laser/Coblator reduction of Turbinoplasty, correction of deviated nasal septum, nasal polypectomy, and Sinus surgery are a few among them.